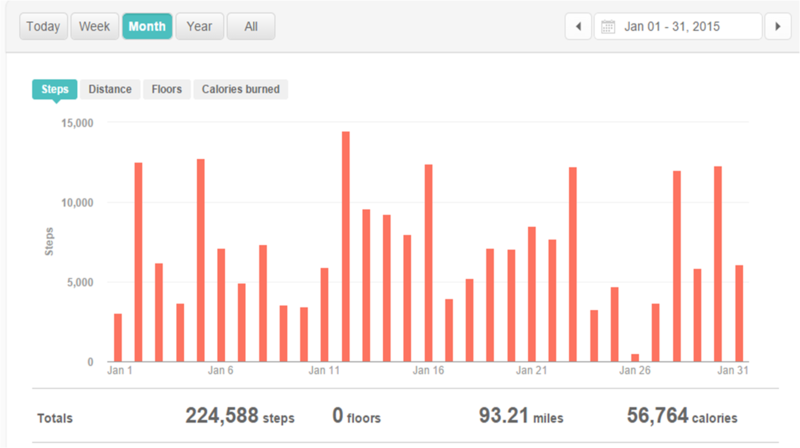 307 minutes of cardio [December=273] — That’s an extra half hour with less runs than last month! Total Distance = 22.22 miles — I used to run farther than this in a week. Progressing this slowly is necessary, but it’s frustrating. Fitbit — Average Daily Steps: 7,244 [December = 7,648] –I forgot my FitBit at home one day. I did increase the number and duration of my workouts, which is great. I did not however accomplish anything in the way of losing weight. In fact, I gained 4 pounds and then lost it. 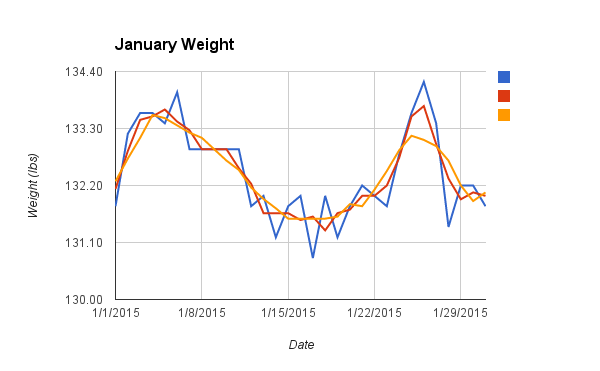 I don’t think I’m going to track my weight daily in February. Part of me feels like that’s a cop out, just avoiding the problem. The other part of me thinks that taking the focus off daily weight gain/loss will refocus me on working out and running for sake of improving stamina and strength; refocus on eating better both to save money and feel healthy. Tracking it daily isn’t motivating me any better than not tracking it. So, for the month of February I’m going to focus on eating homemade food and more vegetables. At the gym I’ll focus on increasing my cardio minutes and building up to a base of 3 mile runs so that I can officially start half marathon training in March.